Synopsis: A world famous opera singer becomes trapped in a hostage situation when she’s invited to perform for a wealthy industrialist in South America. Thoughts: It’s been four years since Julianne Moore won her long overdue Oscar for Still Alice and she’s largely avoided the Best Actress curse popping up in interesting, if underperforming, films like Wonderstruck and Suburbicon. In 2018 she’s back with two interesting projects: Gloria, a US remake of a popular Chilean film and this adaptation of Ann Patchett’s bestseller which casts Moore as a opera singer who becomes a hostage and political chess piece in a South American uprising. Written for the screen and directed by Paul Weitz (Admission, Grandma, Being Flynn) and co-starring Ken Watanabe (Godzilla) I have to say this looks more important than entertaining. Also, while I’m glad they are being transparent that Moore’s singing voice is dubbed by the legendary Renee Fleming based on the few shots of her singing I’m a bit nervous it’s going to look too fake-y. 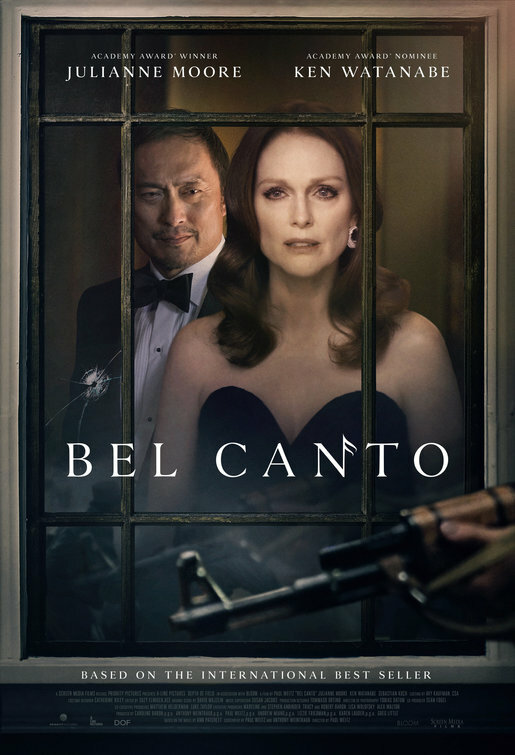 In the end, it’s Moore that appeals to me so I’m always interested in her work…but Bel Canto feels like it has an uphill battle in front of it.